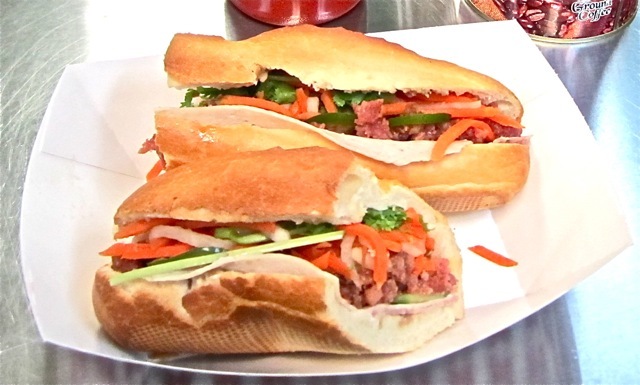 There have been a number of articles recently, including a major spread in the New York Times, extolling the virtues of, bánh mì, Vietnamese pork sandwiches served on a baguette. While it has been reported that they were invented by Vietnamese immigrants to the US for local consumption, one of my readers (see comments below) informs me that this is false; in fact they existed in Vietnam and were brought to the US by immigrants after the war. In response to the publicity, my friend Piglet and I went to one of the best bánh mì places, Baoguette, at 61 Lexington Avenue (between 25th and 26th Streets), which has received awards from New York Magazine and Time Out New York. Our conclusion: the fuss is justified. Five dollars will buy you a sandwich consisting of pork, pork pate, pork terrine and pickled vegetables (including daikon and carrots) and cilantro with hot (or less hot) sauce. The flavors are just sensational! On a subsequent visit I tried a similar sandwich, but made with chicken; excellent, but doesn't match the layered complexity of the pork version. There is also a beef version (Sloppy Bao) which I have't tried. Baoguette also has branches at 37 St. Mark's Place and 120 Christopher Street. There are other places to find bánh mì, and I hope to try as many of them as possible. Click more for the list compiled by the New York Times. AN CHOI 85 Orchard Street (Broome Street); (212) 226-3700. BANH MI SAIGON BAKERY 138 Mott Street (Grand Street); (212) 941-1541. BAOGUETTE 61 Lexington Avenue (25th Street); (212) 518-4089. BAOGUETTE CAFE 37 St. Marks Place (Second Avenue); (347) 892-2614. BA XUYEN 4222 Eighth Avenue (42nd Street), Sunset Park, Brooklyn; (718) 633-6601. NHA TOI 160 Havemeyer Street (South Second Street), Williamsburg, Brooklyn; (718) 599-1820. NUM PANG 21 East 12th Street (University Place); (212) 255-3271. PARIS SANDWICH BAKERY CAFE 113 Mott Street (Hester Street); (212) 226-7221. SAU VOI CORP. 101 Lafayette Street (Walker Street); (212) 226-8184. SILENT H 79 Berry Street (North Ninth Street), Williamsburg, Brooklyn; (718) 218-7063. THANH DA I 6008 Seventh Avenue (60th Street), Sunset Park, Brooklyn; (718) 492-3253. THANH DA II 5624B Eighth Avenue (56th Street), Sunset Park, Brooklyn; (718) 492-3760. Actually, banh mi is indeed straight from Vietnam. It is French influenced due to Vietnam being colonized by France more than a century ago. The baguette itself is made with rice flour, which gives it an airy, crisp texture. When we immigrated to the States, we brought the recipe over with us. Glad to see you enjoy it! Thanks for the information, Geeky Girl. I was misinformed by The New York Times on the origin of the bánh mì. I just had one in Paris and it paled in comparison to my favorite Baoguette. I wonder if Baoguette uses rice flour; the baguette seems pretty run-of-the-mill so I suspect not. By the way, geekygirl, do you have a favorite Vietnamese restaurant (or two) in New York? I love Vietnamese cuisine but have not found a really great place yet. I had a very disappointing bánh mì sandwich in Paris' Chinatown when I was last there, but now I am on the track of a good one. Clotilde, in her Edible Adventures in Paris, recommends Saigon Sandwich, 8 rue de la Présentation, 11ème. I will report when I get to try it, but if any reader gets there, please share your experience.